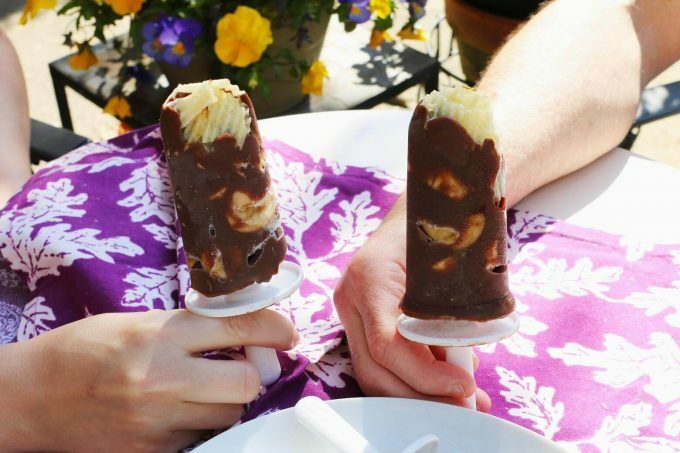 These Ruffles chocolate banana frozen pops are the perfect combination of salty and sweet! Add them to your summer backyard party menu! This post has been sponsored by Frito-Lay. All thoughts and onions are my own. We recently had some friends over for a little backyard BBQ. Our usual backyard menu is pretty simple – we make burgers, hot dogs, sausages, and roasted potatoes. It’s easy and delicious; our guests never leave hungry and probably bring home some leftovers. Since I usually go the easy menu route I figured it was time to make an easy dessert too. 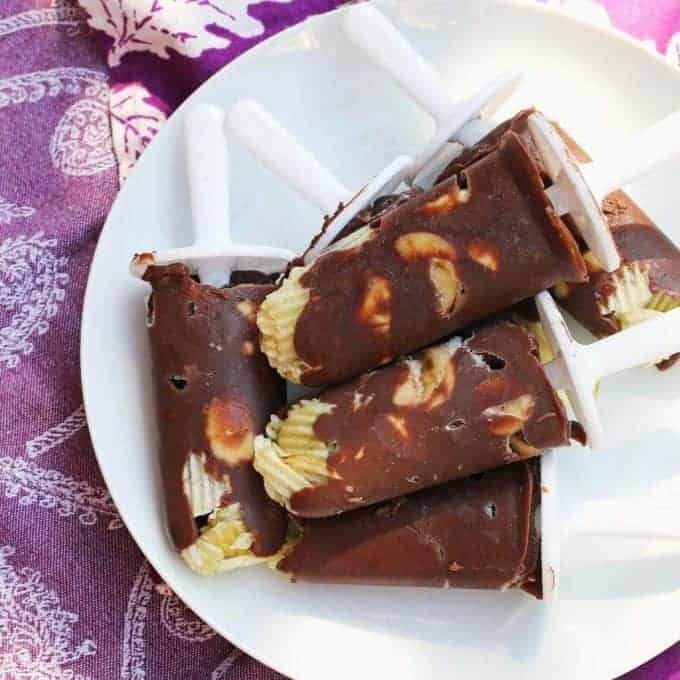 The night before I knew we had guests coming over, I put together these easy Ruffles chocolate banana frozen pops. You can use any frozen pops mold but if you don’t have one, small paper cups and straws work well too. Start by making some instant pudding. Remember, we are going easy here so we can have more fun and spend less time in the kitchen. No melting chocolate in this house over the summer. 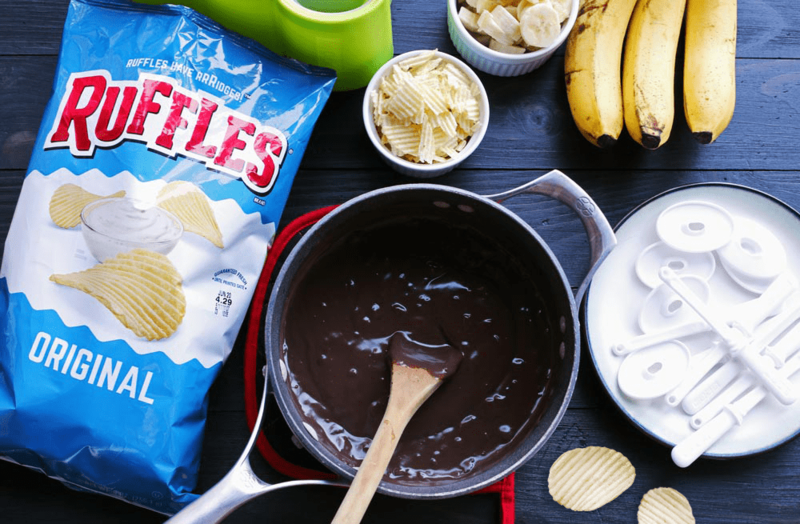 Then chop up a banana and break about 10 Ruffles potato chips into small pieces. Set up a prep station with all of your ingredients and after your pudding cools a little bit, you’re ready to get started. First drop your crumbled Ruffles potato chips into each pops holder. Top that with pudding and then some banana slices. Next make sure that the pudding and bananas have dropped all of the way to the bottom so they freeze to the chips. If you have to, bang the holders against a hard surface or use a spoon to push everything down. Repeat with more chocolate pudding, banana pieces, and the rest of the pudding. 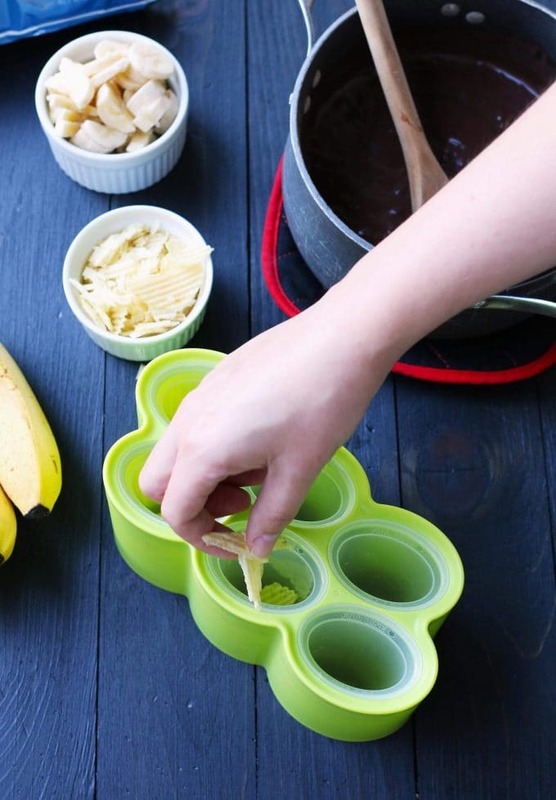 Time to put your molds into the freezer! You will want to let them freeze overnight. The next day, after your guests have eaten dinner, bring out the frozen pops. They will be the hit of the party! 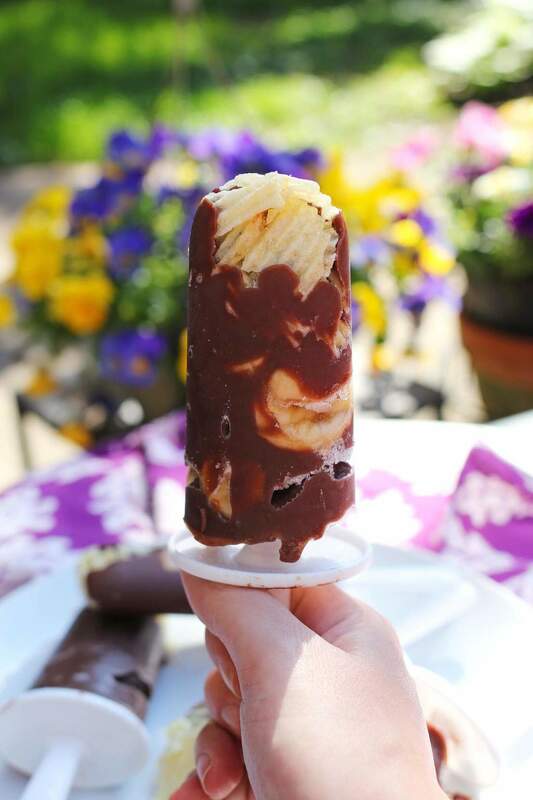 Not only are these Ruffles chocolate banana frozen pops easy to make, they are super delicious. By adding the chips first, they are still crispy and salty – just what you want when eating Ruffles. 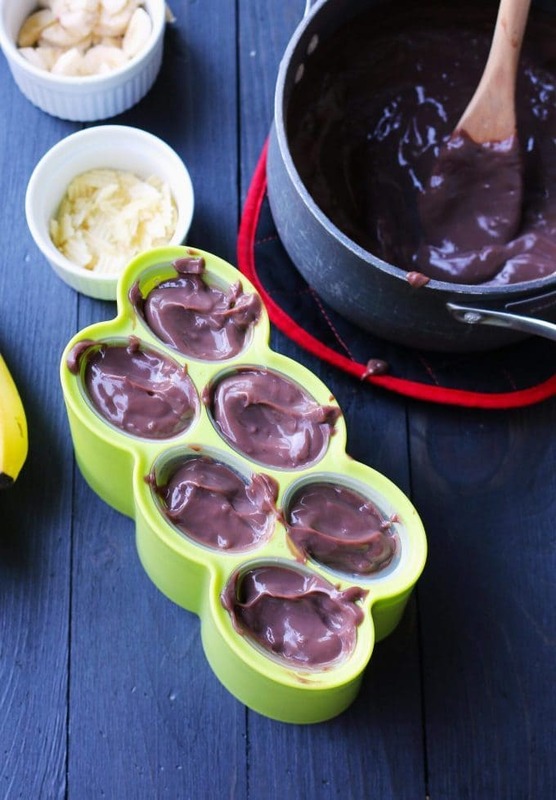 Add to that chocolate pudding and bananas and you have the perfect summer treat. Check out more great summer recipes here! Prepare the chocolate instant pudding according to the box instructions. Once cooked, set aside to cool for 5 minutes, stirring frequently. 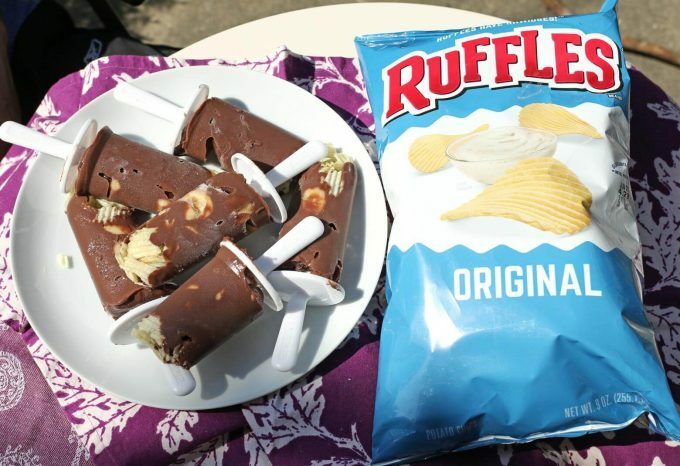 In a popsicle mold, evenly distribute the crumbled Ruffles potatoes chips. 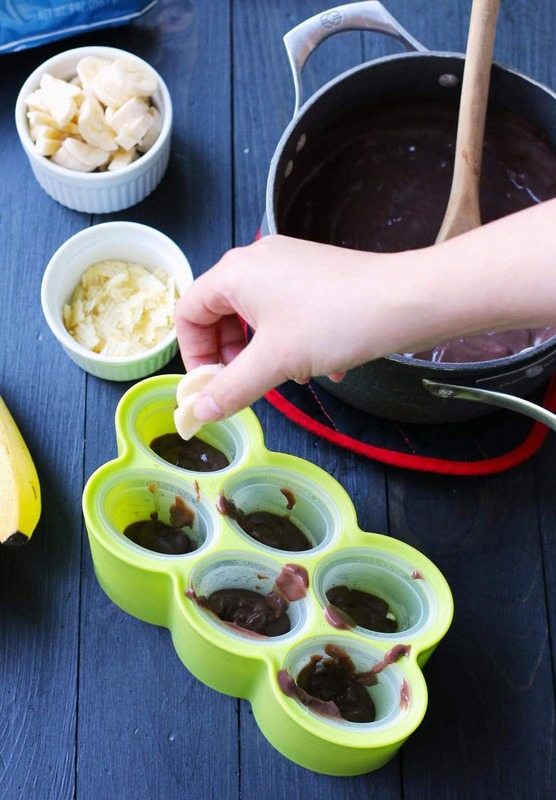 Top with 1/3 of the chocolate pudding and half the banana slices. Repeat with the 1/3 of the chocolate pudding, the remaining bananas and then the remaining pudding. Place in the freezer overnight. Serve cold. Love this salty and sweet combo. What a perfect summer treat! Is there anything better than a pudding pop? I love that you combined sweet and salty with the chocolate! Sooo good! I love salty/sweet desserts! Can’t wait to try them!! Now, this is something I’ve never seen before!! Love your originality! Love this Sweet and Salty Combo! Such an awesome summer treat!! My kids would LOVE these! !